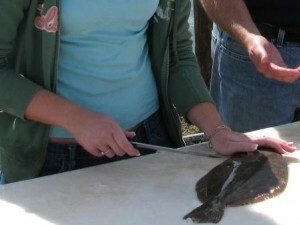 This tutorial page includes step by step instructions for cleaning flounder, fluke, sole, and halibut. 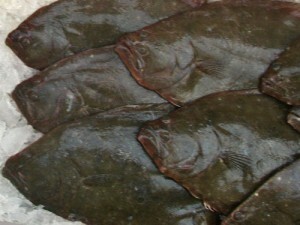 The method produces high quality boneless fillets. Step 1. Scale the fish thoroughly. Rinse frequently to aid the scaling process. 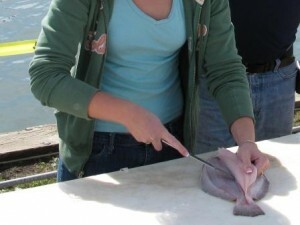 Cut down the center of the fish, across just behind the stomach and just behind the head. Step 2. 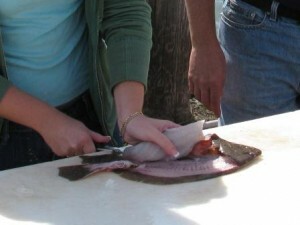 Cut from the center outward along the ribs, working from the spine out toward the fins. Step 3. Peel the fillet up as you cut it free. Step 4. 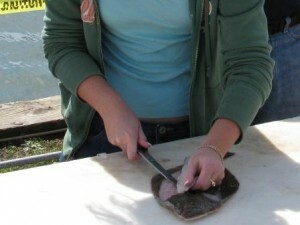 Cut the fillet free from the outer edges of the carcass. Step 5. Repeat the process on the lower section and of the back and both halves of the underside. Step 6. 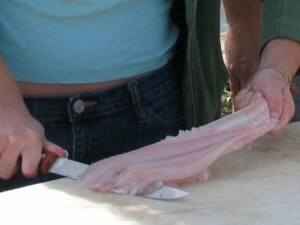 (Optional) Starting from the tail end, carefully cut skin from meat. Step 7. 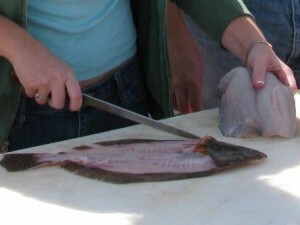 Rinse each fillet immediately put on ice or in a refrigerator.